When the season started the majority of fans, media, analysts and even small time bloggers, like me, all thought that if the Bears can just show up with a league average NFL offense the Bears defense should carry the rest of the team into the post season in 2018. Well, don’t look now but the Bears are ranked 11th in the league in yards gained at 380.7 per game. Just behind this past Sundays opponent the New England Patriots and just ahead of the Detroit Lions. What? Yards don’t matter? It’s about the points you say? Well, they are currently ranked 6th in the league with a 28.3 points a game average. This narrative was especially so given the great start the defense got off to in the first 4 games. Of course, you still had that fourth quarter eye sore against the Packers in that 4 game stretch but we’ll get back to that later. Point being, the offense is contributing plenty to the team for it to remain contenders throughout the season for the post season. Probably not good enough to beat teams like the Rams, Patriots and Chiefs but aside from those 3 teams I don’t see one team the Bears can’t hang in there with right now with this offenses contributions. Sure, his last game was sub-par if you’re holding this team and their starting Quarterback to a playoff standard. However, it’s clear Mitch Trubisky looks like he’s developing into a solid if not special Quarterback right before our very eyes. With all this offensive progression so early in the offenses inception the defense should be the rock steady if not spectacular phase of this team. There is no learning curve here. This defensive staff and most of it’s personnel is now in their 4th year together. They also have gotten roster upgrades in Kahlil Mack, Aaron Lynch, and have gotten early significant contributions from draft picks Roquan Smith and Bilal Nichols. There are younger players who have developed into better players like Roy Robertson-Harris, Eddie Jackson and Eddie Goldman. Factoring all this in with the fact the Bears were actually ranked in the top ten in many important categories In 2017, and the fact they’ve actually taken the ball away, one should expect to see increased defensive production. Dare I say significant more production. Opposed to the previous 3 seasons under Vic Fangio and this defensive coaching staff. There is no way the Bears should be 3-3 at this moment. There’s a case to be made for the Bears possibly being 6-0 if the defense held up their end of the bargain. And here is where I’m going to go in on Fangio and his rigid way of thinking. We’ll start off with loss number one. The Bears spotted the defense a 20 point lead all the way up to the midway point of the third quarter when the Packers finally got on the board with a field goal. Here, in game one is when you see the first signs of a now continuing trend in how Fangio approaches his game planning, in game adjustments and in use (or lack thereof ) of his personnel. With a hobbled Aaron Rodgers who was carted off in the first half when a Bears lineman landed on his extended knee the Packers adjusted at the half to slow down the rush by going to a quick passing game. When Rodgers returned to start the second half after treatment on his knee at halftime, Rodgers consistently got rid of the ball in just under 3 seconds per average drop back. That’s when the Packers started moving the ball. While this was happening, Fangio decided to play soft zone coverage and stick to a basic 4 man and even in some cases a 3 man pass rush. Of course this played right into what the Packers were trying to accomplish. Rather than pressing hard and physical at the line on their Receivers to disrupt the timing of those short routes they were running, Fangio had his Corners either in off coverage or a soft press with no chuck at the line. This allowed the Packers receivers to get into their routes on time. Rather than exploiting Rodgers limited mobility by sending pressure up the A gap using delayed blitzes and even a mug look possibly sending two backers through both A gaps, he preferred dropping his pass rushers into coverage. A lot of the time without even the zone blitz which replaces the Edge Defender after dropping into coverage with a blitzer. Usually an interior Linebacker. This along with some shoddy tackling on the back end allowed the Packers to YAC their way to victory. The Miami game saw a lot of the same types of things. The Bears got a favorable matchup when Miami’s starting Quarterback Ryan Tannenhill was replaced by journeyman Quarter Brock Osweiler in a last minute change just before the game start. Rather than change his game plan and even adjust during the game to defeat the statuesque Osweiler he stuck with the same plan he had for the more mobile Tannenhill and again the Bears were short passed to death relying on huge YAC totals and, again, poor tackling by the Bears defense to eventually win the game. It was almost a carbon copy of what happened in Green Bay. Rather than physically press their receivers to disrupt the timing of the short routes and sending pressure in the face of the immobile Osweiler they laid back with a basic pass rush even after Kahlil Mack suffered his debilitating ankle injury. 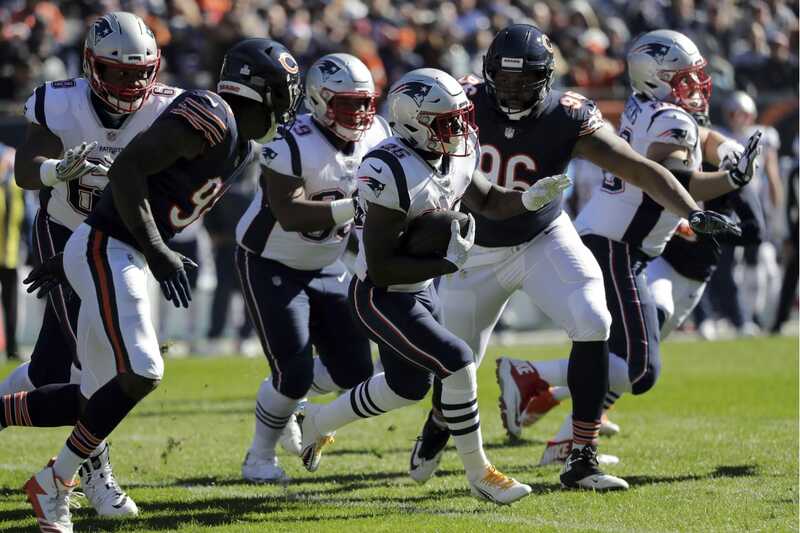 This past game after two examples of how to beat the Bears defense Bill Belichick had a relatively easy blueprint to follow and like De’Ja’ Vu the short quick game killed the Bears. Again, with an immobile Quarterback in Tom Brady they decided to drop their pass rushers into coverage rather than attacking into the face of Brady and play off or soft press versus their receivers again giving receivers free releases into their short timing routes, and giving Brady open passing lanes to step into the throws with timing and precision. Scheme is one thing. Sure, I have an issue with the approach and the game plans and lack of adjustments in game, but you should be able to put your personnel in the best position to succeed. The lack of matchup exploitation drove me nuts in the Patriots game. Everyone but their grandmothers knew Smith should cover White one on one. Everyone except Fangio clearly. Smith also didn’t play too many snaps. Only 55% of the snaps as a matter of fact. Aaron Lynch was hardly out there too. Where was Isaiah Irving? And why is a lame Mack dropping in coverage along with an over-matched Floyd who he had playing man at times on Brady’s favorite safety blanket James White? These questions need to be asked and it will be interesting to hear what answers Fangio gives when his presser happens later this week. I understand that they now have an offense that can score some points and you can afford to be more conservative and sit back and play coverage. Maybe get the ball back to your offense to get more points and eat more clock, but you can’t play a scheme the same way you play it versus every team. Each team has match-ups that expose your weaknesses and exploit theirs. You have to adjust accordingly. It’s pretty obvious the book is out on how to beat the Bears defense. It’s time to burn that book. Thank you! A number of us Bears fans have been saying this same thing. The Packers in the second half, showed the world how to beat the Bears…three step drop, get the ball out fast. Which Fangio made consistently easier, by playing his CBs 10 yards off the ball. Dolphins and Patriots showed the Bears still haven’t figured out how to stop that gameplan. Fangio has played soft coverages, giving a good cushion, which plays right into this style. There is always a chance, that Fangio doesn’t have faith in the CBs to play press man, thinking that will be worse. But he has take the chance, since playing soft has literally cost us games, what’s the worst that could happen? We lose a game that we were already going to lose playing soft coverage? Whatever the case, it’s time for Fangio to step up. He has better tools in his toolbox and has done less with them. I anticipate some adjustments being made. There is no way that Pace and Nagy haven’t met about this and discussed it with Fangio. Thank you Scott I do appreciate it but my ex wife could have nailed this and she could give two shits about the game. I’m almost embarrassed hitting this off a tee.